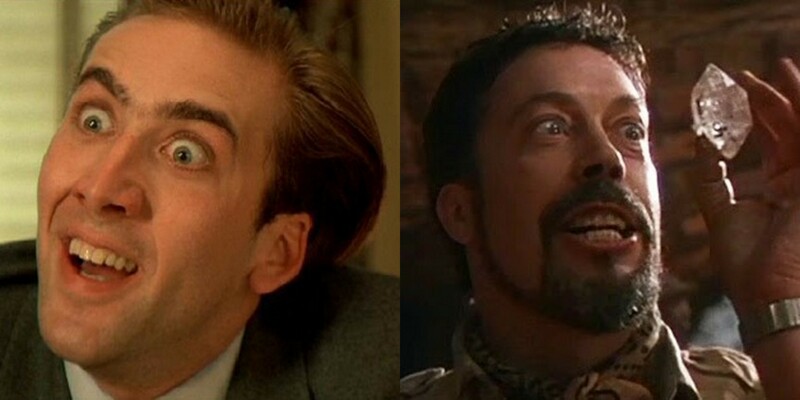 Who is scarier: Nicolas Cage or Tim Curry? Disgust? Well…I’ve never been trapped in a cage, but I did have a bad curry once…I think my face showed terror then for a while. Ooo… these puns caused me physical pain. Is “both” an acceptable answer? In this case: yes. Yes, it is. Nearly every time I see either of these gentlemen on television, I’m afraid he’s going to jump out of the screen and eat me alive. A very rational fear, honestly. I would have to give Nicholas Cage the leg up on scariness here. He just seems like he could snap at any second most of the time. On the other hand, I love Tim Curry so much, it’s hard for me to think of him as scary, outside of specific creepy roles. I like him very much as an actor, but Mr. Curry has a particular smile that I find unnerving.